Two (2) $5 Blue Seal National Currency bank notes, depicting the portrait of President Benjamin Harrison, obverse. "The Landing of the Pilgrims" engraved by Charles Burt (Scotland/New York, c. 1823-1892), reverse. 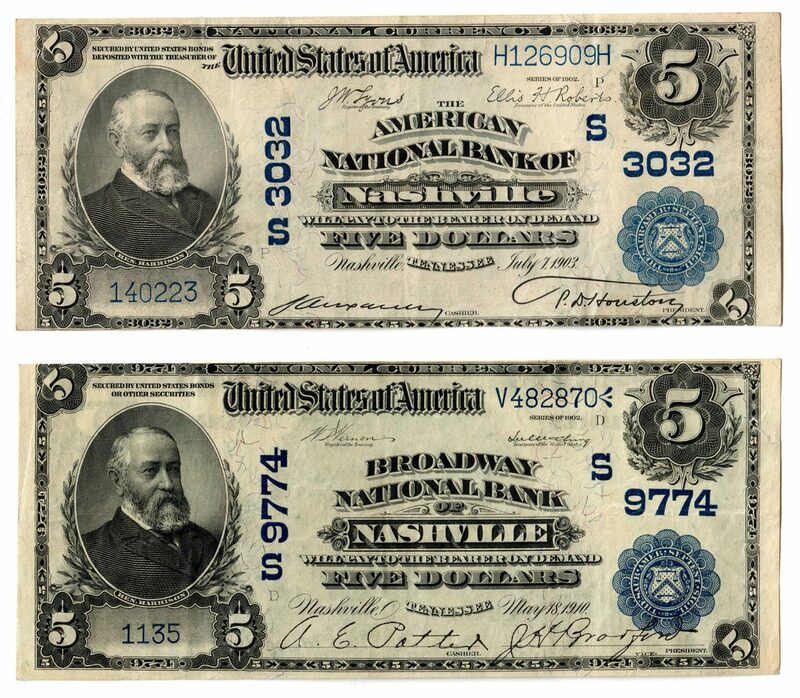 1st item: $5 "Date Back" bank note dated 1902 from The Broadway National Bank of Nashville, Tennessee. Second Issue. Serial # V482879/1135 pp D. CH # 9774. FR # 593. Vernon/McClung signatures. 2nd item: $5 "Plain Back" bank note dated 1902 from The American National Bank of Nashville, Tennessee. Third Issue. Serial # H126909H/140223 pp P. CH # 3032. FR # 598. Lyons/Roberts signatures. Provenance: the collection of the late James A. Newman (Nashville, TN, 1892-1964). CONDITION: 1st-2nd items: Very Fine condition.